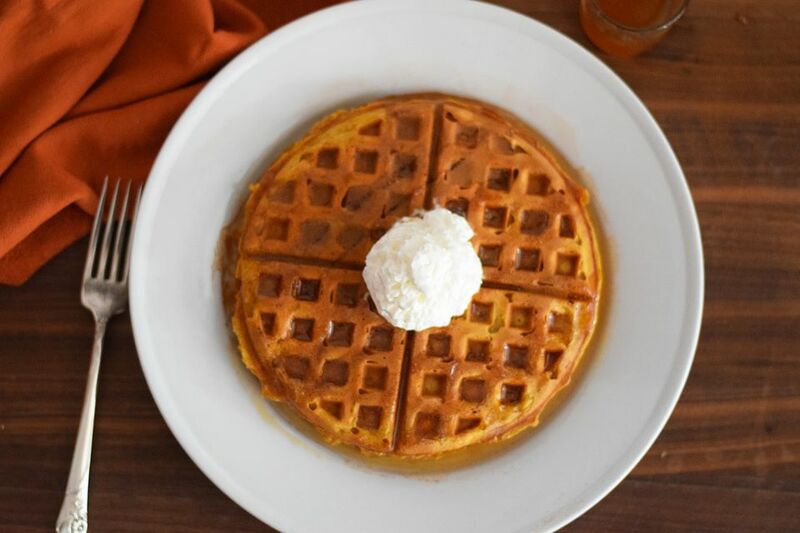 It isn't fall without pumpkin and your day can't start without breakfast, right? Begin a cool autumn morning on the right foot, with a hot cup of coffee and a stack of these delicious pumpkin spice waffles! These waffles are made with pumpkin puree and pumpkin pie spice, then topped with a cinnamon caramel syrup that's so good, you'll want on everything from pancakes to cinnamon rolls. You could honestly just eat the topping with a spoon, but the crispy, fluffy waffles are perfect for soaking it all up. Add chopped pecans or other nuts to add a little crunch and whipped cream for the perfect finish. In a medium saucepan, combine the butter and brown sugar. Stir with a wooden spoon every few seconds. It will lump up and then start to smooth out after a few minutes. Add the heavy cream. Be careful, as it will foam quite a bit. Stir it in with the wooden spoon and allow to boil for one to two minutes. Turn off the heat, stir in the vanilla extract and cinnamon and set aside until you are ready to serve. You can keep it warm on extra low heat if you wish. Begin making the waffle batter. Heat your waffle iron as you're mixing the batter. In a large bowl, whisk together all of the dry ingredients, including the spices. In a mixing cup or other medium sized bowl, mix together the pumpkin puree, milk, butter, eggs, and vanilla extract. Add the wet mixture to the dry mixture. Whisk until combined, being careful not to over mix. Allow to sit for five minutes and then begin cooking your waffles. Add about 1/4 cup of the batter to the waffle iron at a time. Cook until fluffy and crispy. Once all the waffles are complete, drizzle them with the cinnamon caramel syrup and top of chopped pecans (if you wish) and whipped cream. Make the cinnamon caramel syrup ahead of time if you wish. It will thicken when it cools, but just heat it up in the microwave or on the stove top in a small pan and it will loosen back up and be ready to pour. To make sure the waffles stay toasty until you're ready to serve them, heat your oven to 200 F and place them on a tray inside as you finish to keep them warm and crispy. If you don't have the nutmeg and cloves, you can substitute "pumpkin pie spice," which is a pre-made spice mixture that often contains these spices. Feel free to make only the syrup and then put it on plain waffles or make the pumpkin waffles and then top them with regular syrup. Both the syrup and the waffles are a little more involved than the basic version of each respective dish, but they are both well worth it and delicious together.